This article appeared on Devex on 14 September 2015. Click here to view it on the Devex site. A text message might save a life, a game may help build a different future and a new app may map the challenges. What is clear is that a variety of new technologies and the data they help gather have the power to be the tools of peace. But what are those technologies? How are they being used? And what opportunities may be available? Devex takes a look at six tech companies – a set of organizations that specialize in everything from using SMS and social media to report conflict to using gaming to bring together so-called enemies – that are changing the face of international peacekeeping. In early 2012, a small group of people had the idea to use text messages to collect information from people in the conflict-affected area of South Ossetia, the site of a war between Georgia and Russia in 2008. What started as a data gathering effort soon expanded to an effort helping people on the border who had no other recourse. Fast forward to 2015, and Elva is working in South Sudan, Syria, the Netherlands and Indonesia. As they expand their presence globally, van Embden Andres said they are also looking to expand as a tech company. “We want to build something [like an app], not something tens of thousands of people use, but millions of people use,” he said. Build Up, an organization that incorporates technology and peacekeeping, may be a fairly new, but it was founded by a team of veteran experts. Helena Puig Larrauri, co-director and co-founder of Build Up, puts an emphasis not only on the role of tech, but on the way we look at countries that are categorized as post-conflict. It’s this sort of deep, localized consideration that has allowed Build Up and the Build Peace Conference to innovate and bring a voice to the voiceless. In South Sudan, Larrauri and her team have worked on making short videos where people talk about, and spread the message of, peaceful coexistence. These videos include voices from women and youth, which are often largely hidden from the conversation. And to get the message out, they plan to offer these videos to people at small shops and stores where they go to charge their cell phones. This combination of the use of technology and consideration of the community in which they are working, is creating an environment for tangible progress. PeaceTech lab started as part of the Unites States Institute for Peace but became a separate nonprofit last year, in an effort to expand the organization to include the private sector. Himelfarb was president of the lab when it was part of USIP and has been involved in tech since the 1990s. Under his leadership, PeaceTech Lab has conducted exchanges in places like Iraq, where they gather players from a variety of fields to fix a problem — from mappers and designers to local leadership — so that good ideas actually have a chance to be implemented. In Iraq, for example, one project has been to create a system where IDs can be processed more quickly to try to address the crisis for internally displaced peoples. Himelfarb is now working to expand these spaces and ideas. “We are really working on the heartbeat of the lab right now,” he said. A pioneer in the use of technology to gather data and prevent conflict, Ushahidi was born out of the post-election conflict in Kenya in 2008. The founders of Ushahidi, which means “testimony” in Swahili, used SMS to gather information about what was happening on the ground. “It busted this myth that you couldn’t get people to express their views during a crisis,” said Build Up’s Helena Puig Larrauri. Since then it has grown from a data collection service to one that uses the information gathered from SMS, email and social media to map hot spots, provide data visualization and data management. All of this information is used to connect first responders, aid organizations and others with people on the ground. Most recently, Ushahidi launched a new tool, upgrading its entire system, which likely means its reach will extend beyond the 20 million posts or testimonies it has already registered. While many of the leaders in the field of peacekeeping are using mobile phones to reach people, one Israeli company is using another widely-used platform — games. The nonprofit organizes Play for Peace weekends which gather groups of mostly youth from the region to play Minecraft, and in the process creates a space for interacting and collaborating to build something together. In 2014, 70 gamers from Israel, the Palestinian territories, Jordan, Egypt and other Middle Eastern countries met virtually to build an amusement park. While Minecraft has been the game of choice thus far, Games for Peace is looking to expand. Either way, it gives Middle Eastern youth a chance to work and interact with the “other,” an opportunity that they may not be afforded otherwise. From Ebola in Liberia to commodities in Iran to mapping conflict zones in Syria, First Mile Geo is a data-collecting platform with an expansive reach. 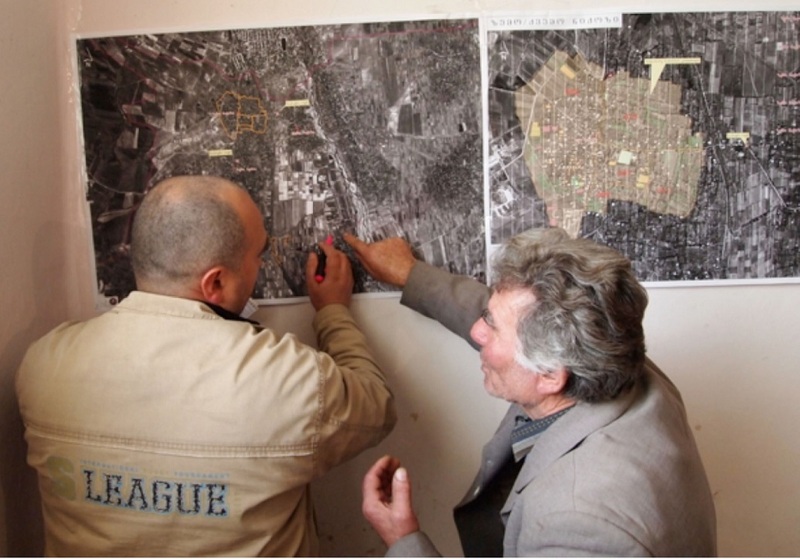 Recently, Caerus Associates, an American research and analysis firm, tasked First Mile Geo with data collection in Syria. They began with using four data collections points in Aleppo: bakeries, checkpoints, popular perceptions and territorial control. From that data, they mapped everything from the number of hours neighborhoods in Aleppo had electricity to the proliferation of militant groups. Much like the other tech organizations, the goal has been not only to gather data more efficiently, but to then get it into the hands of aid organizations and analysts more expediently. Conflict in Context is a month-long global conversation on conflict, transition and recovery hosted by Devex in partnership with Chemonics, Cordaid, Mercy Corps , OSCE and USAID. We’ll decode the challenges and highlight the opportunities countries face while in crisis and what the development community is doing to respond. Visit the campaign site and join the conversation using #ConflictinContext.